Lanterns add a festive glow to reception tents or the outdoors. Outdoor weddings have become a popular trend among engaged couples. A reception tent makes it easy for a couple to get married and have the reception on the beach, in a garden or just simply under the night sky without inclement weather ruining the ceremony or the party. Lights are an important decoration to wedding tents. They add a warm, beautiful glow to the atmosphere. Paper lanterns fill up space and add choices when for your light decorations. Before you can hang lanterns, first you need to select what kinds of lanterns you want to hang. 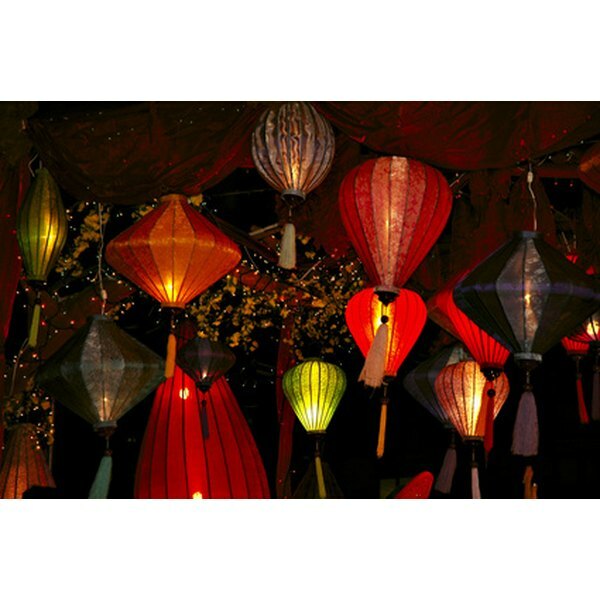 There are several different sizes and shapes of paper lanterns available from the Paperlanternstore.com, Bed, Bath and Beyond, or even the dollar store. Decide whether you want the lanterns hanging all in one spot, or scattered around the reception area, and, if you have varied sizes of paper lanterns, figure out where you want each size. Your decision will depend on whether you have a tent or you are just using whatever resources are available outdoors, like trees. Put the lanterns together. If you plan on hanging the lanterns high, get battery-operated lanterns so cords wont be running everywhere. A battery pack from the Paper Lantern store costs $4.50 and comes with 12 LED lights and a 10 inch cord to hang it in the lantern. Using an extension cord for lanterns outdoors is less conspicuous, so save the cords for the trees. Measure out how low you want the lantern to hang, and then cut and attach fishing wire to the top of the lantern. (See references one and two). Place the ladder directly underneath the spot you want to hang the lantern. Depending on how much time you are willing to devote to hanging the lanterns, you may want to install a hook using a screw driver and a couple of screws. Some lanterns actually come with hooks. However, tacking or nailing the lantern in place can work just as well. Climb the ladder, making sure you have some holding it in place so you don't fall. Tie the end of the fishing line that is not attached to the lantern around the hook, nail or tack. Then screw the hook, or hammer the nail or tack into the ceiling. If you have a tent, and it has rods in the ceiling, tie the other end of the line to the rod. Purchase strings of twinkle lights and some tiny paper lanterns. Put the paper lanterns over each light and string the lanterns around the limbs so they look like they are floating in the trees. Or, hang strings of twinkle lights with the baby lanterns on them on the top rails of a house if it's a home wedding or even along the top of the tent if you are using one. String strands of twinkle lights from one tree limb to another across the walkway. Count the number of lights you have spanning the walkway. After you have counted, Martha Stewart Weddings recommends that you take that many white paper bags and cut an X in the bottom. You may want to put a piece of construction paper or cardboard on the bottom of the bag to reinforce it. 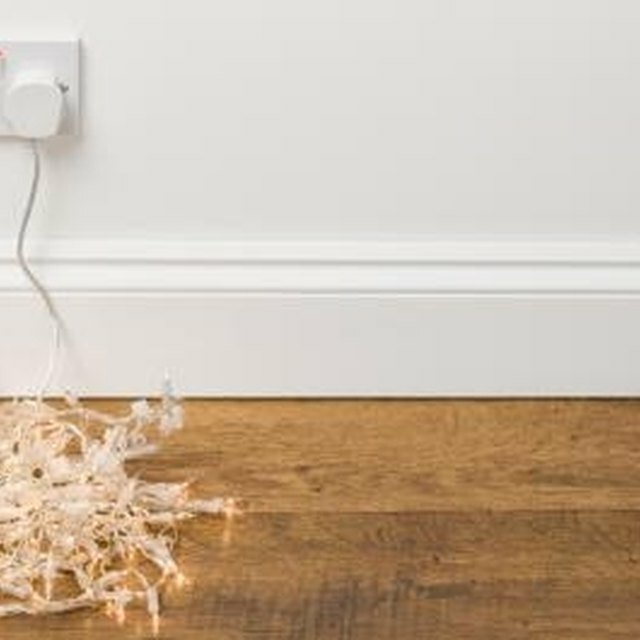 Using a ladder, remove the bulbs on the strand and insert the socket through the bottom of the bag where you cut out the X. Screw the lights back in, and then slide another bag over the first one to make the bottom. Use tape on the top of the bags to attach them or tie a piece of ribbon around them to keep them in place. Adrianne Loggins is a freelance writer. She has a Bachelor of Arts degree in English from Furman University and a Master of Arts degree in journalism from Northeastern University. Her writing has appeared at Bodimojo.com, in the North End's Scene Magazine, and in the New England Newspaper and Press Association Bulletin.